Joker is the main protagonist of the series, stealing precious artifacts as he pleases. He's immensely passionate about his job as a phantom thief, and goes as far as to get noticeably offended and verbal at the accusation of being called a simple and petty thief. He believes himself to be a miracle maker which hands out advance notices, giving fair ground and footing between the victim and himself. Joker believes this is very different from thieves who commonly resort to the tactic of sneaking and going about their business unnoticed in a cowardly fashion. Joker is seen to have a teasing and mischievous behavior to some things; taunting opponents with humorous yet somewhat rude comments, borderline bullying, and even making side comments about deeds that most certainly would not side with heroic tendencies. Despite such, he very rarely goes through with what's within his words of teasing, as it seems to just be a way to fluster and anger his unfortunate victim. Joker had a strong relationship with mother and father before their passing. His father had promised him the key to one of their family treasures, a key that had caught Joker's eye far more than the treasure itself. This would only be if he was able to solve a puzzle while his father and mother were off on a trip. Due to a plane crash, Joker's father and mother were killed and would never return. 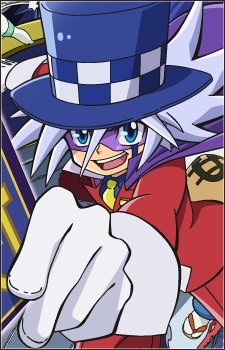 Joker was originally intrigued and inspired to become a phantom thief by Silver Heart as a child. By the display of being a 'miracle maker' during the conflict between them and Professor Clover, 'Jack' and soon to be 'Joker', sneakily hid upon Silver Heart's plane and made it clear he had no intention of going back to his house; but to become a genuine phantom thief like him. Joker received the scar upon his left eye due to an incident as a child. Joker at this time was in his phantom thief training alongside Spade and Queen. After sneaking out against Silver Heart's wishes, Joker met Cyan and Rose, a sibling pair that resided in a village that 'had no name'. This was to prevent it from becoming known to the world, as Rose held magical 'witch-like' powers that would most likely be abused if found out. With fear of Silver Heart's wrath upon his return, Joker a bit cruelly had Cyan dress up as himself and pushed towards going back to pose as him. Joker cruised around with Rose before Cyan was found out, and he escaped to return as he was absolutely fed up with what he was forced to deal with. Before Cyan could reach the village in time, it was attacked and destroyed in order to find 'the Witch', Rose.